The Rundle Manor- one of Banffs best kept secrets- is an apartment style hotel located in downtown Banff on a quiet side street just off of Banff Avenue. Great shopping and the best Banff has to offer are literally steps away from the hotel. 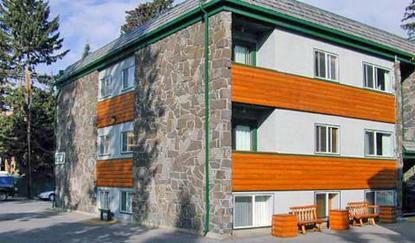 Guests of Rundle Manor have complimentary access to the health facilities and spa of the Banff Ptarmigan Inn- and room service provided by Caramba Restaurante.Known for great value- the Rundle Manor features twenty four suites- which sleep from 2 to 8 people- full kitchens and living areas. All rooms are tastefully decorated with pine furnishing and rustic decor- complete with bathroom and bathroom amenities- telephone and cable television. The fully equipped kitchen comes with a fridge- microwave- toaster- pots- pans- plates- cutlery- and coffee maker. Ski storage is also featured in each unit.